Scenes of jubilation in 1978 when Bal finally captured the divisional football title after years of coming so close. Captain Teddy Holland is carried shoulder high by stalwarts Leo Meade and Sam Kingston at Sam Maguire Park, Dunmanway. The Ballinascarthy club was formed in 1945. The current club caters for 20 teams of all age groups from under 6 years and upwards in both hurling and football. The first taste of success and reward for dedication and enthusiasm of club members came in 1956 when the junior (2) Footballers captured the South West Championship. It was a marvellous achievement at the time considering that the competition was then contested by all the Junior 1 teams eliminated in the first round of the premier championship including first string sides from major clubs such as Bantry and Skibbereen. Hurling was revived in the club in 1961 and three years later in 1964 the club captured their first hurling silverware when defeating Clonakilty in the first round, then Newcestown and went on to play Barryroe in the final in atrocious weather conditions in a game which marked the first significant hurling win at junior level for the club. 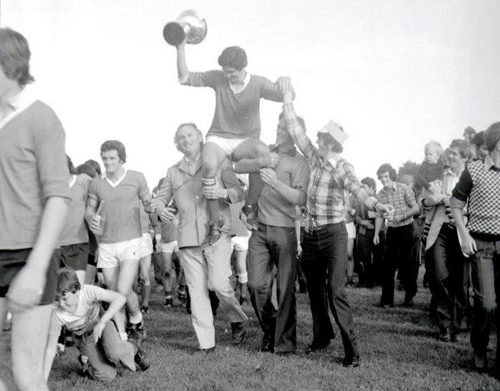 The coveted trophy in West Cork junior football âThe Little Norahâ was finally captured in 1978 after many close and heartbreaking defeats during those preceding years and in particular 1959, 1960, 1968 and 1969. Having accounted for Carbery Rangers in the final the team went on to win an epic county quarter final game with Kilmurry and narrowly lost out to eventual county champions Kildorrery in the semi-final which was played in Pairc Ui Choimh. In 1983 a second title was secured when Gabriel Rangers were defeated in the final. Again the team bowed out agonisingly at the semi-final stage to eventual county champions Donoughmore. The junior A hurlers captured their first title in 1989 when landing the Flyer Nyhan trophy after defeating Newcestown in a marvellous final and as a bonus the league trophy was added later that year following a tremendous inter-divisional county campaign which just eluded them after a replay defeat by Clyda Rovers in the final. Success in top grade junior hurling returned in 1997 when Ballinascarthy overcame favourites Bandon and back to back titles were secured twelve months later against the same opposition. In the millennium year the feat was repeated after a replay win over Barryroe to make it three titles in four years and complete the most successful period of the adult clubâs history. It should be noted also that in each of these years Ballinascarthy were defeated at the penultimate stage by the eventual inter-divisional county champions. The club has been successful at minor and U21 level over the years winning a hurling and football double in 1985. The clubâs first county title success was secured in 2004 when the minor hurlers brought home the county B hurling championship. The first ever county title at adult level was achieved in 2013 when the U21 hurling side defeated Watergrasshill in the final at Pairc Ui Rinn.